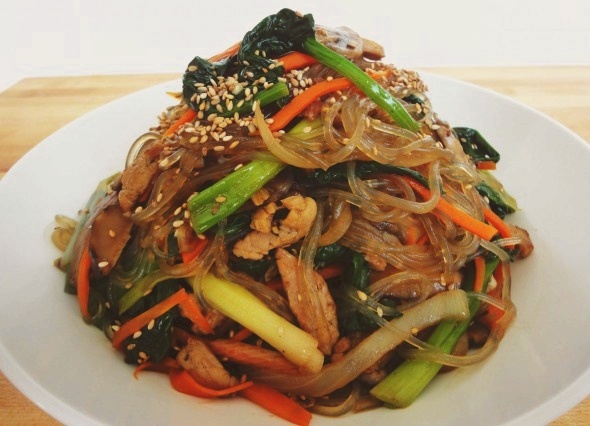 Japchae (Stir Fried Glass Noodle with Vegetables) is one of Korean’s favorite traditional dishes. Japchae can be served with rice and Kimchi, or as a side dish. Photo below is an example on how Japchae, the dish will be like. This awesome recipe is invented by a lady, Korean Chef Maaangchi. Check out her page for the full Japchae recipe and comments. interesting recipes….i must try some!. Japchae is even better when cooled slightly so that it’s not so sticky. One of my all-time favorite dishes!